There is now not only a debate on whether austerity for Europe is good or not, but also on whether austerity in Europe exists or not. 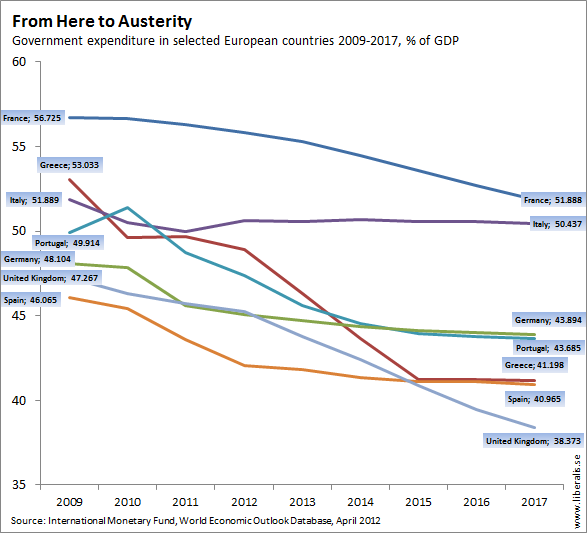 In a blog post by Veronique de Rugy at the Mercatus Center titled ‘Fiscal Austerity in Europe Doesn’t Mean Large Spending Cuts‘, she claims that many European countries “haven’t significantly reduced spending since “austerity” supposedly started in 2008”. Ryan Avent at The Economist did then writte a reply titled ‘Yes, there is austerity‘ in which he argues that “[t]he supposed absence of austerity in Ms de Rugy’s figures is mostly a product of poor graph scaling and a reliance on nominal, absolute figures”. This entry was posted in Allmänt and tagged austerity, debt crisis, Europe. Bookmark the permalink.